Producer/Director Albert is preparing a new documentary about “The Making of Bluegrass Country Soul” which will be a part of the special 50th anniversary edition box-set. This video will be for anyone interested in bluegrass music, independent filmmaking, or both. Albert started making films when he was 12 years old, and won First Prize in the Kodak Teenage Movie Contest when he was 18. 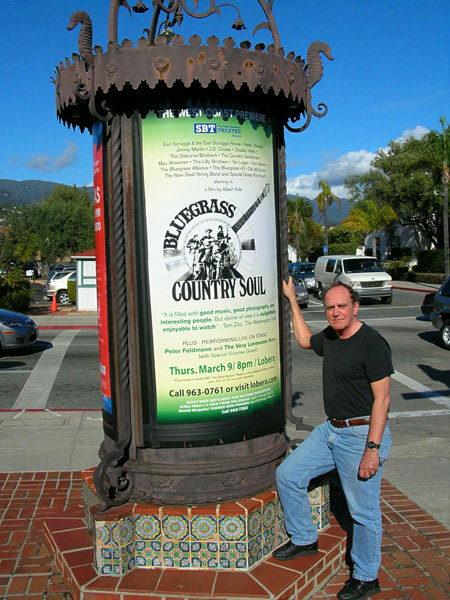 Albert Ihde standing next to the kiosk at the Lobero Theatre in Santa Barbara, CA, where his bluegrass film was shown to benefit SBT: The Santa Barbara Theatre Company. The Student is a short 16mm, black & white film Albert made while a senior majoring in drama at the Catholic University of America in Washington, DC. TV viewers who have seen Mr. Robot and Smash will recognize Michael Cristofer in his first film role. He helped write the screenplay that eventually led to the production of Bluegrass Country Soul. In addition to his many stage and screen acting credits, Michael is a Pulitzer Prize and Tony Award-winning playwright as well as a director of plays and motion pictures. The Sun Dagger, a PBS special narrated by Robert Redford, and featuring Joseph Campbell, about a Native American sun calendar on top of a 500-foot butte in New Mexico. Reno’s Cabaret Reunion, a five-part series featuring many of America’s top cabaret singers, including Peter Allen, Barbara Cook, Andrea Marcovicci and Karen Akers, shown on Bravo and A&E. In 1992, the first American production of Edward Albee’s Three Tall Women, starring Myra Carter, Marian Seldes, and Jordan Baker, at River Arts Repertory in Woodstock, NY. Also, benefit performances of A. R. Gurney’s Love Letters, starring Joanne Woodward and Paul Newman. In 1987, an award-winning production of the Kurt Weill/Bertold Brecht musical Happy End in Los Angeles. In 2008, the first production to use the full score of Leonard Bernstein’s music and lyrics for the original J.M. Barrie play, Peter Pan, at the Lobero Theatre in Santa Barbara, CA. SIGN UP FOR OUR NEWSLETTER AND RECEIVE ADDITIONAL BIOGRAPHIES, SPECIAL ANNOUNCEMENTS, INTERVIEWS, AND FILM CLIPS. READ OUR NEWSLETTERS TO FIND OUT HOW YOUR NAME CAN APPEAR IN THE FINAL CREDITS OF THE 50TH ANNIVERSARY EDITION OF BLUEGRASS COUNTRY SOUL!